It's amazing what you can automate around the house when you've got a nice, solid Wi-Fi network and a little ingenuity. And $100. That seems to be the gadget freak price point. If it's $100, we can buy it without the spouse totally freaking out. I've setup Alarm.com and automate our home security system from my smart phone. I've setup wifi cameras around the house and plugged them (wirelessly) into the Synology DiskStation as a composite image and 24 hour DVR. All this done with commodity parts and a VERY small amount of know-how. Stuff that only millionaires and folks on MTV Cribs (or Geek Developer Cribs) could have in the past, now we can have just by stopping by Home Depot. 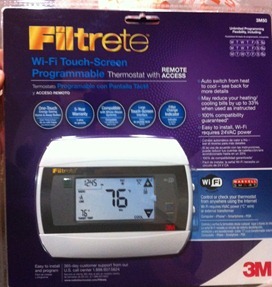 This is how I came upon the Filtrete Touchscreen WiFi-Enabled Programmable Thermostat. My buddy John Batdorf walked by one of these at Home Depot and bought it on a whim. Later that evening he was like "dude!!!" and I did some research. What a clever idea! 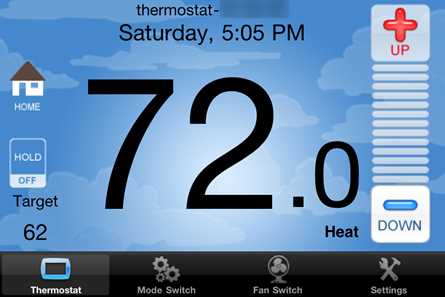 Not just a programmable thermostat, but one I can control from any connected device, the web or any phone (iPhone, Android, etc). This opens up a lot of interesting scenarios where you can get the house ready before you get home, where you can keep it colder and save money if you forgot to turn off the heat before you left. It was $99 at Home Depot and took about 20 minutes to install and we all know I'm not handy. There's only one catch, you really need to have a "C" wire. This is a standard wire that most furnaces have at least run between the furnace and the main thermostat. However, it is possible you don't have it. In my case, I had the wire but it wasn't hooked up at the furnace. This meant I needed to turn off the power to the furnace at the main electrical switchbox temporarily, then connect the loose wire to the power of the furnace, and turn it back on. I tested it with a simple cheap multi-meter from Radio Shack (or Home Depot, of course). 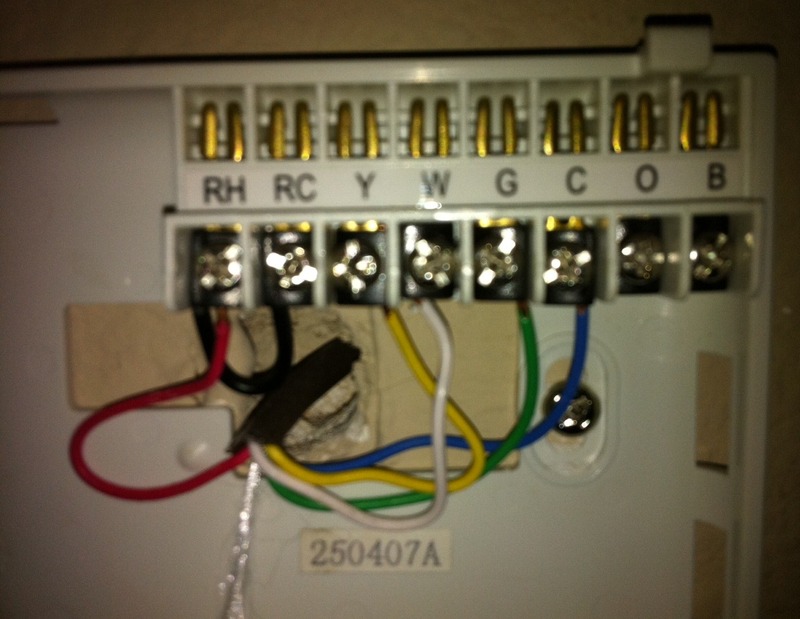 If you like, you can also run a new wire between the thermostat and the furnace. Finally, if none of that works, you can use a standard wall-transformer and plug it into the wall. It just won't be as sanitary. The installation process was a little nerve wracking initially just because I'm not a wires guy but the installation PDF was pretty clear and the wires were clearly labeled. Once the wires were hooked up and I confirmed I had power and plugged in some backup AA batteries, it was just a matter of registering the thermostat with the Wi-Fi network. I was impressed that it supported WPA security as I've standardized on it. I wouldn't have used the thermostat if it only supported WEP. Nice to know that WPA and WPA2 have finally arrived in cheap consumer devices. Of course there's a website to manage the thermostat (or any number if you have multiple) but there's also multiple phone applications. I usually access this from my phone. There's of course the ridiculous first world problem of changing the temperature of the house from bed (which is awesome, by the way.) The think I use it the most for is setting the house to "away" mode. I haven't yet measured if this has saved us money (as we in the past have left the house on 74 for YEARS at time without changing it) but I can only assume it has as there's no reason to heat an empty house. All in all, a great and useful gadget if you're into Home Automation. It is inexpensive without being cheap. Recommended. This is awesome! I want this too!! But does it have a WP7 app?! I have two of these things, and they are in fact pretty cool. The way you join them to your Wifi network is slick - when you first plug them in, they create a randomly-named wifi network. You join your laptop to that and use its web interface (including a mobile version if you browse with a phone) to choose the SSID of your wifi network and enter the password. 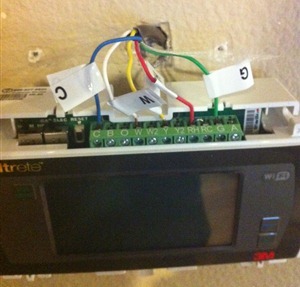 Does anyone know if there's an API for these thermostats? I actually just put one of these in at my house last week. I like it for the most part. The android app is not all that great and force closes all the time, and seems really slow to load up. But it dos work. I wonder if my apartment would be angry with me if I replaced their crappy one with this. I should ask if they'll install it for me if I buy one... I hate how I can't program the current one... we have to manually turn it off and on at different times of the day and it DOES cost a lot of extra money to turn the sucker on in the summer (like, $60-70 extra). @Jacob Neat! I think I'll try to use it to log the house temperature and how long air conditioner runs. Looks extremely simple - REST with JSON. Curious how much you end up using it once the "neat-o" factor wears off. 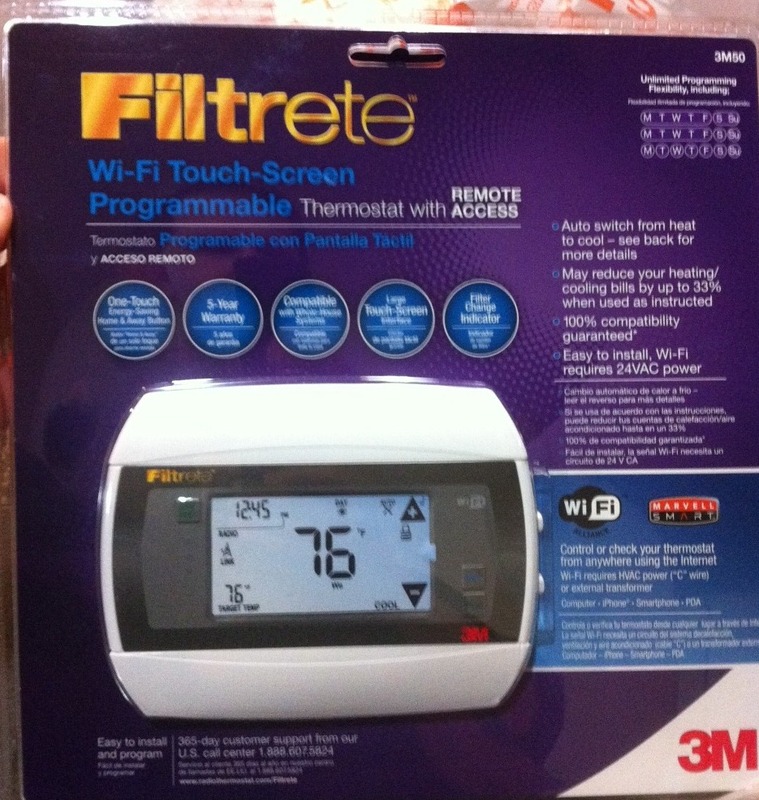 I just replaced my 40-year-old furnace with a new heat pump last week- came with a fancy Honeywell Prestige IAQ thermostat (color touchscreen, AWESOME scheduling wizards, USB programming, wireless, etc). A third party offers an ethernet interface for about $120 that lets you do all the same things- just not sure it's worth it. The "change the temp in bed" thing does sound awfully attractive, though- hate it when I wake up in the middle of the night and it's too cold/hot to get back to sleep. Denis - I added this router, turned WiFi off on my cable modem, and all my problems went away! Matt - It's not like I use it EVERY day, but the neato is there at least a few times a week. chr ehr - Thanks for the info! That looks great! This is awesome; maybe this will motivate me to do more home improvement projects. This is awesome, gonna go get one this weekend. Just installed this myself. Couldn't have been simpler (I was lucky in that whoever installed the prior stat had all the wires available and even matched wire colors.) Still need to install a firmware update as the current firmware won't accept a WPA key over 31 characters. 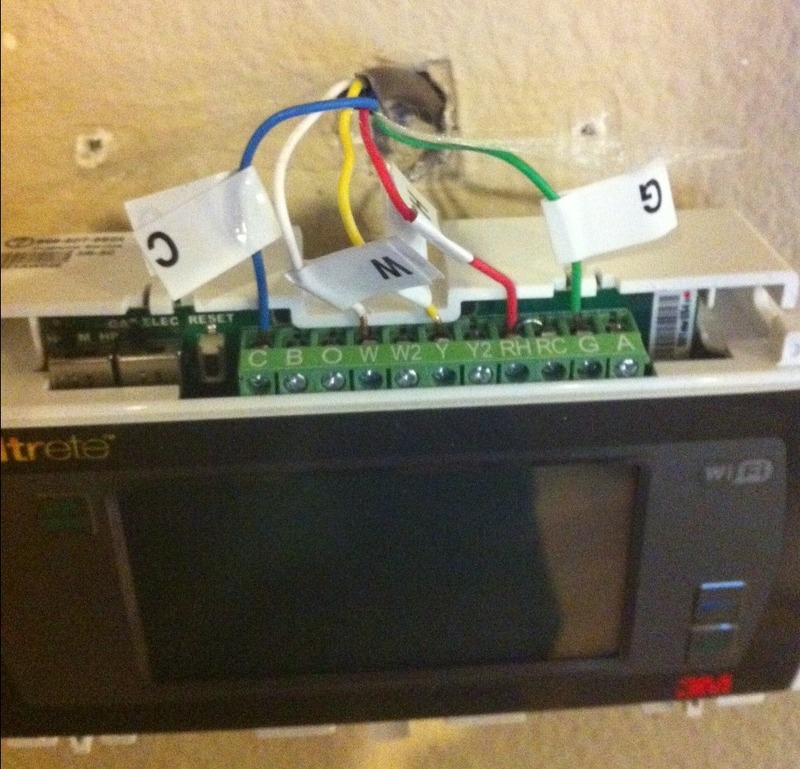 Funny to find this blog post since I purchased two of these yesterday and had an installer come out to run the C-Wire. I had a hard time with the WiFi setup due to security and the issue with WEP and just not connecting to WPA2 setup. I finally turned off WEP security and it sync'd up right away. I love this device because I can control it via PC, iPhone, or iPad. Also like the fact that it has a programmable API than I can query the thermostat directly and issue commands using curl. Awesome and hope the continue to improve the product and allow us to hook up into GoogleMeter or Pachute. Just need a Windows Phone 7 application now! Scott - Home Depot has an electronic/wifi-enabled brick called the ElectroBrick with some neat features. It transmits the weight of the brick (even though it's constant over thousands of years) over wifi and also has a sensor which tells you when it's been laid and mortared. It's a bargain at $25 and I use mine every day. It's neat! Had one for almost a year now. Works great! Allows my wife to set what ever temp she wants before she heads home from her office. Although since the last firmware update I have been having issues with it maintaining a connection to my wireless network. Looks like that link for the wifi cameras is bad. I'm curious what you're using so I'm hoping you'll fix it ;)! There is another post here that demonstrates the API. Anyone know if this would work with heating systems outside the US? As in - what is this C wire of which you speak? I just got one of these over the weekend (thanks to getting tempted by Scott's post, I'm 100 bucks down!). I learnt quite a bit about wiring in general and what each of the RGYW and C wires do. My old HoneyWell t-stat had a C terminal but it was not used. Luckily whoever wired it had 3 spare wires left including the common blue wire aka C wire), so it was a matter of opening up my HVAC and tracing the blue wire and hooking it up to the C terminal of the HVAC. The HVAC already had 2 "other" blue wires hooked up which I guess are for the heat and A/C so it was a little confusing but I noticed another unconnected blue wire for C that I shaved off the insulation from and hooked it up to the C terminal of the HVAC. I was a little nervous opening the HVAC since I have never done so and I'm far from handy, but as the old adage goes "Nothing ventured nothing gained"
What is the thermostat you included the screenshot of? Not sure if you're still following this conversation or not considering you posted right around 60 days ago. The C wire in the common wire of a HVAC unit. 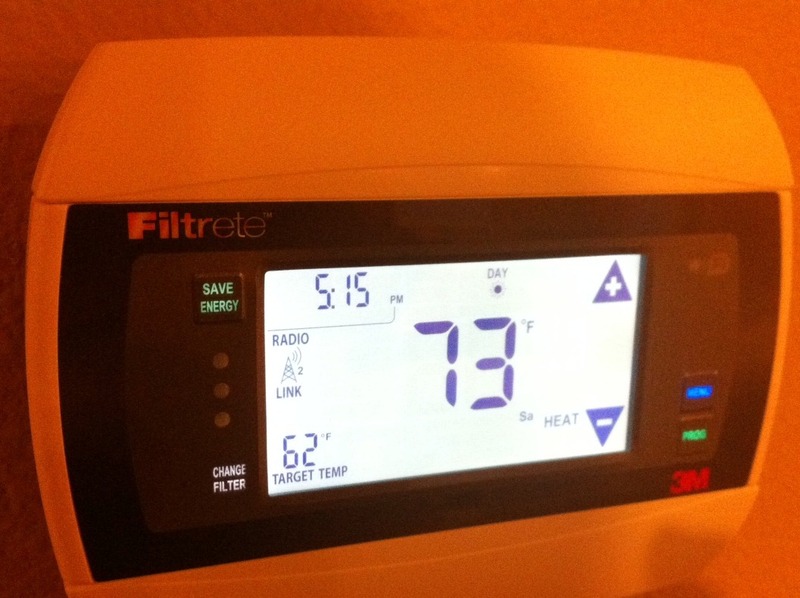 It provides a 24 VAC tap from the air conditioning unit to the thermostat. Without it the wireless module would drain a set of batteries inside of a day. As for working outside of the US, I don't know. I just ordered mine today so not sure if it will support 50hz AC mains power should be be in that part of the world. Has anyone else felt like there were issues with the accuracy or response time of the current temperature reading? Last night my wife and I started talking about how cold it felt, we were in the same room as the thermostat. I checked it, and it thought it was 74 degrees. I would have put it closer to 66. So naturally the heat did not kick on, so I did a reset, then it thought it was 76. I had already dropped the temp using the calibrate function when I bought it, so I was well beyond adjustment range. After a few hours, it seemed to correct itself. Continuing testing, it kicked on correctly today, but the temp did not rise as fast as the other thermometer that I am now comparing it to, yet to be seen if it also falls slowly, if so, I will likely be able to live with it, as it will just generate a 3 degree temperature swing.